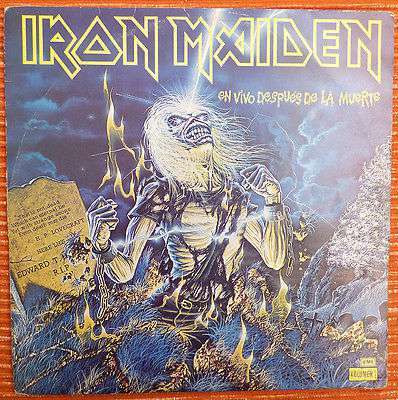 IRON MAIDEN LIVE AFTER DEATH VOL.1 URUGUAY SPANISH TITLES RARE PROMO EDITION LP! Rare uruguayan promo edition, with title and tracklist titles translated into spanish on cover and labels, and original inner sleeve. Very hard to find in any shape!! Cover:VG shows worn but still nice. This record plays nice!, from begining to end, with some surface noise while listening, and between songs, or quiet parts of a song. Visually looks fine, with some hairlines and scuffs here and there, specially one, first song of side one. First song of side 2 begins with some background noise but then sounds great. Please look at the pictures for cover grade. I listen each record in my Dual 1224 turntable, with diamond needle, and middle arm weight. Please contact if you have any question! By the new Ebay policies all users must add the kind of shipment and estimated time of arrival of the package. The shipping I make are certified and with a PARTIAL tracking number, and the estimated time of arrival could be the same or longer than what appears on Ebay, it all depends on the post office of each country.